if you are the king of the hill and get hit you must run a distance from the hill while some one that is attacking the hill can become king by running to the hill and gaining it. for a different game there can be nerf tiggy, only one gun needed if you are "it" you have the gun and you can ither tagsome one with your hands or just shoot them, and if you arnt it and get tagged or shot the person that was it drops the gun and runs away from you since you are "it"
This is something I thought of late last night, I'm sure someone has already thought of this but i haven't seen it anywhere. Players: Large groups would be best, so 15 people or more. Gameplay: there are three 'objectives' that the attacking team will need to capture, and the defending team will need to defend. The objectives will be attacked sequentially (e.g. Obj.1 will be attacked first and then Obj.2 and so on). The attackers will spawn at the attackers deployment and the defenders will spawn at the objective behind the one being defended (e.g. if Obj.1 is being defended, defenders spawn at Obj.2) until they reach Obj.3, this is when the defenders use there deployment. For an objective to be captured, one of the attackers must have their hand on the Obj. for a set amount of time (yet to be decided). The attackers need to capture all the objectives to win and the defenders must hold at least one objective until the time is up. The picture below might help explain a little better. Respawn Rules: If you are shot you must hold your gun in the air and shout "Hit", "Out" or "Yep". After being shot you must run back to your deployment or to the objective behind you and either count to 30 or reload your guns before you are aloud to come back in. Weapon restrictions: depends on the size of the playing area, if it is small, guns like big blasts will not be aloud. so yeah, thats what i have so far, let me know what you guys think. Door_Beatle wrote: "A bunch of stuff and a picture"
I really like that idea actually. I'd assume you will time how long it takes to capture all the spawn points then swap sides and the team that does it the fastest wins the round? Just try it with mates anyway. Don't wait for a pat on the head. You're more likely to get a positive response if you post this up then come back later and say tested it out with (eg.10) mates and I made the following changes.... these made it run much more smoothly. yeah will definitely try this out soon, and i wasn't waiting for a pat on the head i just wanted to see if anyone was interested. It wouldn't be worth trying out if no one would be interested in playing. Thanks for your help btw. Even if no one here adopts the match idea your friends might love it. Here's another scenario. It's a paintball match I've played before. It's played with two teams. one team seats up somewhere with very good cover(I'd suggest the tarps that were used recently at one of the queensland wars). Each player on the team in the cover has only a single life. Once one team succeeds the teams swap positions and play again. The team with the fastest time crossing the border is the winner of the round. |____| ----- |_____| Forts on either side of the "victory line" when a player is shot they must move back out of the fort. Ok I sort of riped this from a game but anyway. Everybody gets a NF and 1 bullet. If you shoot your bullet and miss you can't use your gun again and need to resort to barrel tapping. If you shoot your bullet or barrel tap and hit a target you get another bullet. At no point in time are you allowed to have more than 1 bullet. matt.chopper wrote: Ok I sort of riped this from a game but anyway. Good concept. Will be hard to enforce. WAY too hard. It starts out with 2 (or more) teams split up into even groups. Each team has the same amount of darts, (if possible, and no recons or Titans. You will find out why later), the same amount and types of blasters, (agin, if possible). Each team has a 'BASE'. Each base consists of the same amount of tents as people. (or if there are 2 to a tent, half the number). Each team has a 'CORE'. To destroy the CORE you will need to shoot it with a RECON or TITAN. The parts of the RECON are hidden around the field. There is a Titan, and a rocket hidden around the field also. You cannot hold the TITAN rockets, and you cannot have the RECON parts if you've already got a TITAN. And vice versa. Your objective is to destroy the core. Here's one I thought up. Both teams have an even number of lives however the cowboys team will start with more players. Cowboys can only use 'Western' era guns like RFR, Mavericks, Double shots and whatever other crap Buzz Bee has out there. Indians are lucky. Although they start with less players they also get to use good guns anything with Bow in the name eg. BBB, +/Ausbow, Crossbow, Bow n Arrow Airzone crossbow etc. If none of these guns cannot be found the indians can have 'stolen' guns so they can use anything the cowboys can. This ruleset can be applied to a number of games. Okay, so this morning I've been thinking and browsing the Internet (dangerous combo) and I had this idea for a nerf war. It sounds actually really stupid to me, but I wanted to know what you guys think. How about an endurance-style nerf war? I mean, like, head north into the bushland with full army gear (helmet, backpack, nerf gun, utilities) for a 48 hour event? Small squads, 3-6 people practicing guerrilla warfare on each other. 2 teams of 3-6 (5 being an optimal number) set up a base in approximately 6-10 square kilometer area of bushland/scrub. Each base must have some sort of thing to capture, like a flag or prisoner. Every team member should be equipped with the nessecery supplies to survive 48 hours. I'm not saying stay awake for 48 hours, that's just how long I had in mind for the match. I had a similar idea except it was a HvZ camp. It will not work unless you actually trust the people you are with. Even some of the best people will be tempted to take your 1337 longshot. Perhaps in small numbers this could work but it's a huge amount of work. Hmm...I agree with you. That's why I keep mine on straps and on my person at all times. the only thing i see is what if people get lost? I used to be an ace at orienteering, in the age before gps units. All i need is a compass... and most times i dont even need one of those, i had learnt to use the stars, sun, and even growth of vegetation many years ago. Gps units are for pussies! Every man should know how to read a map. If you can't you shouldn't be allowed in the gender. I actually intended on not having dumbasses as teammates. Door_Beatle wrote: This is something I thought of late last night, I'm sure someone has already thought of this but i haven't seen it anywhere. You could make it up to the defenders to choose what objective they want to sit at. They would have 1 life each and would be out of the round if hit. Once all defenders are out of that object, move onto the next one, until you have captured objective three and eliminated all defenders. 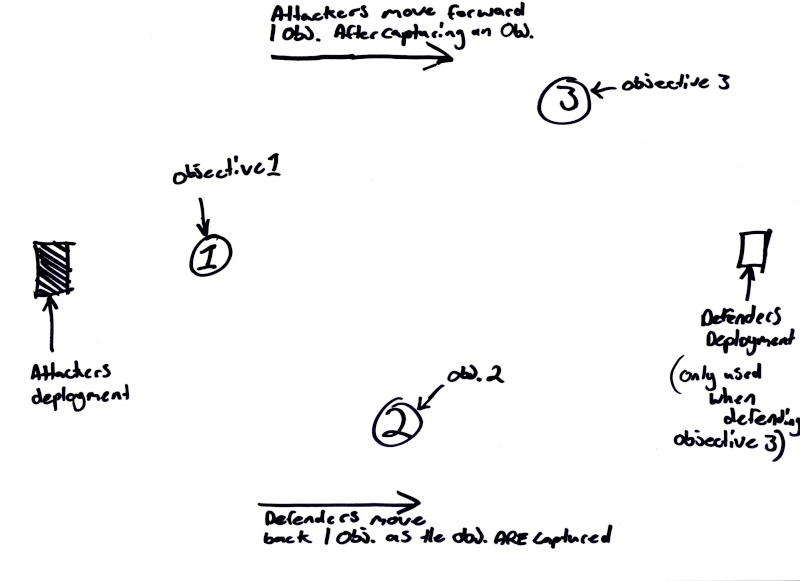 But if all defenders choose to go to one objective and they are all hit, the attackers win. Not really sure if this idea has been already posted, sorry if it already has. Anyway, it's a combination of a simple Get to Objective and then Defend Objective type game, then Escape. This sort of scenario is often found in RTS games. I've tried it in a 2v1 situation (2 ppl stopping the other guy from completing objective) and it works ok; would probably work better with more ppl and a larger playing field - I play inside my house. To make explanations easier, Team 1 is the team trying to get to and then defend the objective, Team 2 is the annoying team. Team 1 has less players than Team 2, but better equipment. When I get my friends over, the person in Team 1 gets to pick his/her weapons first (at least 2 per person if possible). Team 1 starts with only 1 weapon per person, the rest is next to the objective. Team 2 get the remainder of the weapons. You can use whatever method of 'killing' someone (I use 2 shots to body or headshot) you want in this game - it should work fine. Size of playing area: Whatever, but musn't be too large - if Team 1 ppl get hit just before the objective, you shouldn't make them run like 2km to respawn. Team 2 Spawn point: Away from the Objective, but not too far. They are defending it, after all. Musn't be too close to Team 1 Spawn. Objective location: Away from the centre of the field, but far enough away from obstacles like trees that it has a large square area around it (for part 2). How it ends: Member of Team 1 stopping timer (in obvious place in Objective) before timer ends, signals that Part 1 is over and begins stopwatch (see part 2). Scoring: However much time left from the timer when Team 1 reaches Objective is added to their Part 2 time. e.g. if the timer is 3 minutes, and it's stopped at 1 minute remaining, Team 1 gets 60 points (60 seconds per minute). Size of playing area: Whatever you want, but Team 2's spawn point can't be too far from Objective. Team 1 Spawn point: Away from the Objective, but not too far - they ARE now defending it, after all. How it begins: Team 1 member stops timer, records time remaining, signals Part 1 is ended (and therefore Part 2 has begun) and everyone knows that spawn points have now changed location. Everyone moves to their relevant new spawn point and match continues. Scoring: The no. of escaping team 1 members is multiplied by 10 and added to the subtotal score to give a total score. How everything else works: All players MUST know that Part 2 is over, and Part 3 has begun. When Team 1 players are 'killed', they are removed from play. They must exit the playing area and watch without interfering. If ALL team 1 members are eliminated, they automaticaly lose and their score becomes irrelevant. Part 1 simulates reinforcements coming to save a location from being overrun by enemies, Part 2 simulates defending the location until everything is prepared, Part 3 simulates the evacuation of the location. If the timer goes off in Part 1, the Objective is overrun by enemies. If an enemy reaches Objective in Part 2, it simulates a breach in defences and that evacuation must immediately begin. If the timer goes off in Part 2, it simulates that all evacuation processes are prepared. If a team 1 member escapes, it simulates an escaping evacuee(s). If all team 1 members are 'killed' in Part 3, it simulates the enemy killing all evacuees. This generally only works if Team 1 is a smaller team, but may work with equal teams (I don't know). I will update this post when I try a 2v3 situation. PhantomSambo wrote: How about an endurance-style nerf war? I mean, like, head north into the bushland with full army gear (helmet, backpack, nerf gun, utilities) for a 48 hour event? Small squads, 3-6 people practicing guerrilla warfare on each other. +1 this idea. Already starting to organise one for WA! Though not for 48 hours and quite larger. ANYTHING milsim is not suited for Nerf. Full Stop. In bushland... righto, have fun losing 20-50 on darts and polluting the environment on those lost darts. Maybe a Large Park, but not bushland.. However, the park I am planning to use is not actually dense bushland, unless you stray off into the restricted zones. The majority is actually rolling grassland with shrubs and trees, so it is essentially a large park. Anyway, whoever is involved in it is going to be aware of the possibility of losing darts. Swatsonia wrote: However, the park I am planning to use is not actually dense bushland, unless you stray off into the restricted zones. The majority is actually rolling grassland with shrubs and trees, so it is essentially a large park. Yeah I was going to plan one of those, but let me tell you this. It's going to have to be VERY organised. Not gonna happen if it isn't. I like a game they play in canada. Dont know what its called, but there is a high mounted box on either side of field which darts can be fired into. Each team must use team work and give cover for 1-2 shooters to try fill that box with as many darts as possible. So accuaracy and a well modded blaster will be important. Teams switch sides after darts are removed from boxes and counted, but points wont be revealed until after final round. Its a different element than just shooting each other, shooting for points would be fun. That sounds like defend and destroy. They also had this one in the VENGEANCE war where you had to shoot the other opposition's monster. Yep thats pretty much it. Monster Mash they call the monster target game, i have afew of those targets, there really nice. Although this probably involve using hard tipped dart. The weakest material I can think of is using foil. Destroy their shininess! You can use a material which the darts will easily pass through. Would have the target a minimum of 50ft away. What about this. i call it 'Data Steal'. One person has a base, which has 5-8 objects, the first person to get all of the objects from the opponents base wins.